Home and Family DVD Collections are also available for Series 1 and Series 3. Average Customer Review: 5 of 5 Total Reviews: 8 Please write your own review. We are very pleased with our recent purchase! Our family of 11 children have all enjoyed watching the episodes, we feel as though this series is a compliment to the Bible & our early history. We do plan on purchasing the entire set over the course of this coming year. We are using them during our lessons throughout the day as we study through Bible History to give the children a sense of what "bible times" was like. This is an incredible series! It is wonderful to have the stories from the Bible shown in a way that children love and can remember. Thank you so much! My kids absolutely love this series, can watch it over and over! I brought series 1 when my children were one and five years old. They grew up with the videos. My children are now twelve and sixteen and we're still coming together to enjoy series 2 DVD. I use the underground stories to encourage my children to study the bible. I remind them that the time is coming when they'll be persecuted for what they believe. 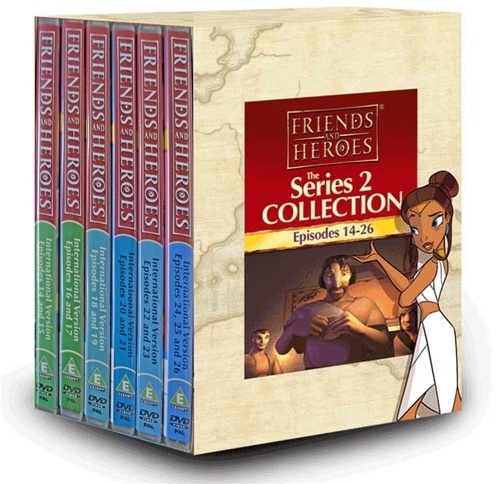 Friends and Heroes DVDs are clean, exciting and funny bible base experience for your children. I strongly recommend the series. We have enjoyed Season 1, so we decided to invest in seasons 2 and 3. We love the story, the Biblical reference, and the beautiful animations. Great story.